The hiking in Bryce Canyon is beautiful and fun, and definitely something that should not be overlooked. Although, there are some who prefer scenic drives, or are just not able to take on the hikes that Bryce has to offer. 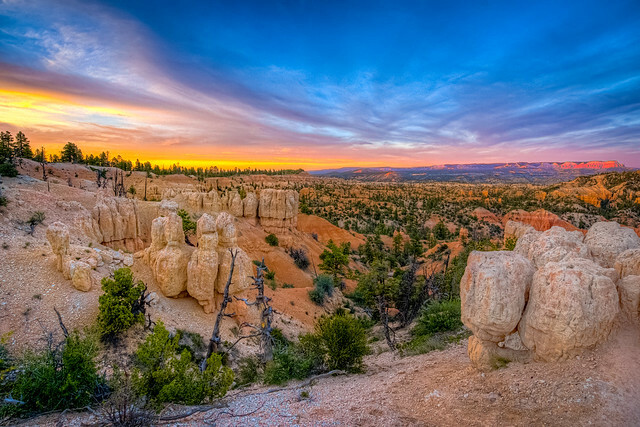 Taking the 18 mile drive is one of the many reasons people visit Bryce Canyon each year. At the visitors center you can find brochures on all of the overlooks and trailheads along Highway 63. Be sure that as you enter the park you keep an eye out on the left side for Fairyland Road, this is one of the best overlooks and give you really a really amazing up close view of the Spires. The drive along Highway 63 through Bryce takes you to the most photogenic view points as well as gives you a feel for what Bryce has to offer without having to take the strenuous hikes. This is a really good ride for those who are unable to hike, in a hurry but want to view the canyon or those who simply want to get the best views of Bryce. Due to the amount of people on the road, vehicles are not allowed beyond Sunset Campground. Vehicles longer than 25 ft. are not allowed beyond Bryce Point or Paria View.